Earn up to 2,595 reward points. Economical DVD copier burns at 18X Speed. The Microboards QD-DVD-125 is an economical DVD copier that burn DVDs at 18X and CDs at 48X Speed. The QD-DVD-125 is a 1-to-5 DVD/CD copier modeled after the popular Quic Disc Series QD-DVD-123 disc duplicator. The QD-DVD-125 DVD is perfectly suited to deliver small runs on demand or to give you in-house control of your digital content. Ease-of-use and a compact footprint make the QD-DVD-125 DVD Duplicator fit for the front office and practical anywhere in your studio. One button copying gives you the ability to make 5 copies at once at the highest recording speed available. 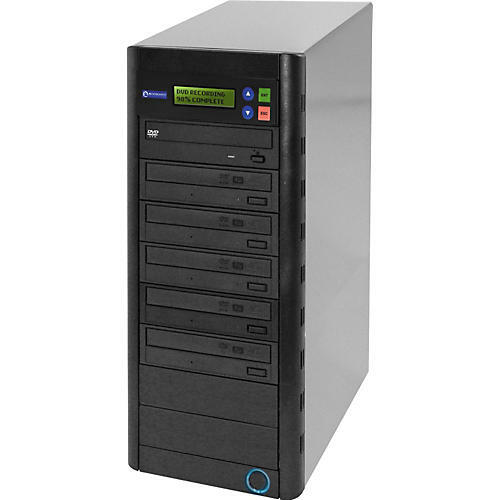 Use the QD-DVD-125 Duplicator as a standalone unit or connect it to your PC for easy mastering via the USB port with the included recording software. The QD-DVD-125 supports DVD+R and DVD-R, and can copy DVD video or data. In addition, the Microboards QD-DVD-125 supports all of the most popular CD recording formats, including audio, data, and more. Even dual-layer DVD discs can be copied on the versatile QD-DVD-125 duplicator. The Microboards QD-DVD-125 is the latest in a long line of award-winning DVD duplicators in the Quic Disc Series, and comes complete with a 1-year warranty.